My how they change so much. Meet my daughter Amanda and our granddaughter Avery. This photo was taken just 6 months ago and you’d hardly know Avery was the same girl. 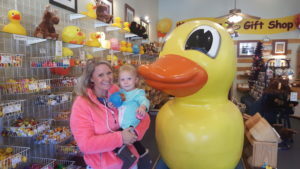 Our little ladybug doesn’t stay in the same place very often, but when she pops into the duck shop, a grin shines from ear to ear! Keep sending in your favorite duck pic and join our scrapbook!